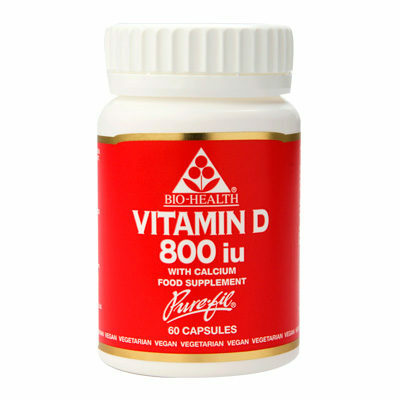 60 x One-a-day Vitamin D 800iu with 140mg Calcium in vegetable capsules. Vitamin D2 as Ergocalciferol from vegetarian/funghi source, providing 800ius of activity. Recent evaluation has made Vitamin D an essential nutrient for many reasons and in particular for the elderly. This vegetarian product as Vitamin D2 with Calcium, makes it ideal to help with absorption and utilization of Calcium, maintenance of healthy bones and teeth whilst contributing to normal muscle function, immune system function and inflammation responses. The information here on the D2 variant of vitamin D (ie it is D2 which is vegan) is in conflict with the information you gave in response to the query on the Calcium+ mineral supplement. From third party sources the information here appears correct and the information against the Ca+ supplement needs the references to D2 and D3 to be reversed. Dear Mr Anderson, many thanks for bringing this to our attention. Please see the response under the Reviews section on the Extra Calcium+ page. The error was that we said ergocalciferol derived from vegetable sources is Vitamin D3. It is in fact Vitamin D2. Vitamin D3 is usually sourced from animals and so we only use Vitamin D2 in our Purefil products.